Walker’s “International Pop” shows links between art, advertising and society. Within the Walker Art Center’s spectacular “International Pop” exhibit, which opens Saturday, are several works directly reflecting the impact that images from commercial culture had on the Pop movement. Most notable is Andy Warhol’s “Campbell’s Soup Can,” but the influence was international, as seen in art like “Special K,” a Pop take on the cereal box from Brit Derek Boshier, and Japan’s Ushio Shinohara’s “Drink More,” which incorporates a Coke bottle. There are many more examples, including “Insertions into Ideological Circuits: Coca-Cola Project” from Brazilian-born Cildo Meireles, in which the iconic image of American commercialism is used subversively in response to Brazilian politics and U.S. hegemony. American hegemony was political, as seen in the “Pop and Politics” portion of the exhibit. But it was also cultural and commercial, and had a symbiotic relationship with advertising. “Many artists in the show were influenced by visual culture that came through advertising, but there was also this inversion along the way where artists’ occupation of advertising culture then becomes something of fascination to the advertising industry, and goes in this feedback loop,” said Bartholomew Ryan, who co-curated the exhibit along with Darsie Alexander. This feedback loop is sometimes seen in “Mad Men,” which has recently roped fans into its final season. The show’s narrative nearly mirrors the Pop era, and beyond the character plots is the drama of the creative process itself, and how it both reflects and shapes the times. “Mad Men,” Ryan said, is told from the perspective of men “for whom society has been set up. ‘Mad Men’ problematizes that and shows how they were buffeted by changing socioeconomic, cultural conditions, which in a paradoxical way they were partly responsible for creating.” Aspects of this underlying discontent can be seen in several works, including Paul Thek’s “Meat Piece with Warhol Brillo Box,” a dark take on Warhol’s “Yellow Brillo Box,” which is also seen in the show, as well as the striking “Still Life #35” from Tom Wesselmann, which features huge images of Royal Crown Cola, Maid-Rite white bread, a can of Libby’s Beef Stew, a Pan Am jet, a pack of cigarettes and two lemons. Interpreting some of the works can be perplexing even for Ryan: “It’s still hard to say whether they’re being satirical or actually embracing it.” The same could be said for Icelandic artist Erró’s “Foodscape,” an overwhelmingly crowded cornucopia on canvas capturing (or questioning?) postwar abundance. Indeed, politics pulls the self-absorbed ad men away from Madison Avenue in “Mad Men,” and was a driving influence internationally in the Pop movement, too, as seen in several works like “Mao,” from Germany’s Thomas Bayrle, and “Mao-Hope March” from Sweden’s Öyvind Fahlström, a four-minute film in which marchers carry large placards of Mao — and Bob Hope. Most work is less lighthearted, however, and its global nature reminds us that it wasn’t just our country that was convulsing. Warhol’s “Sixteen Jackies,” for instance, shows the first lady before and after the assassination. And the president himself is depicted in “John Fitzgerald Kennedy” from Italian artist Sergio Lombardo. It’s a silhouette of a man in a black suit, white shirt and black tie. No need for a face, or even the painting’s title: The iconic image is instantly recognizable. JFK, after all, was one of the Pop (and “Mad Men”) era’s predominant political and cultural figures. 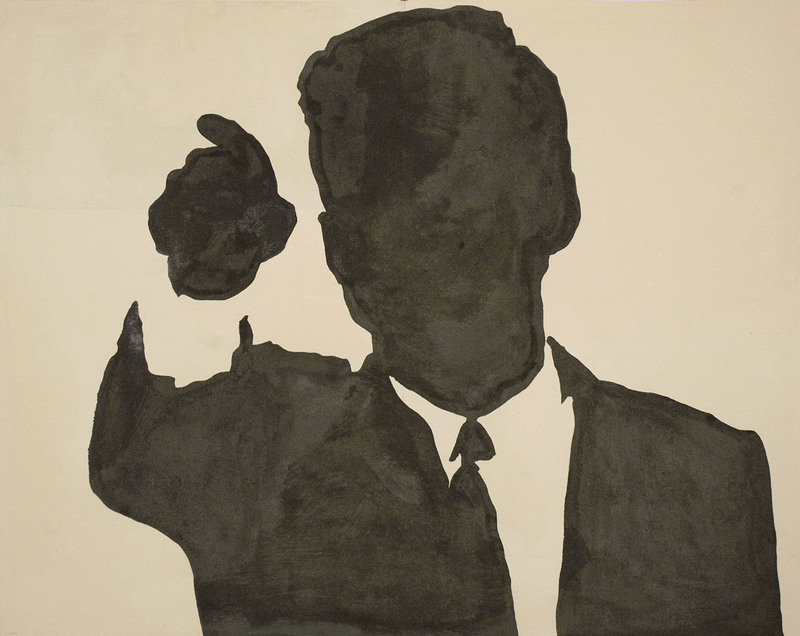 It’s also quite similar to the silhouette of Don Draper, the enigmatic ad man depicted in “Mad Men’s” iconography. It’s not known if the connection was intentional, but it is clear that the links between Pop Art, advertising and the 1960s continue to compel today. Previous Previous post: What is the most interesting and mysterious work of art?